This tutorial guides you through all the major facets of theme development, including editing project assets on your local machine, uploading themes to Dev Center, and applying themes to sites using Site Builder in Admin. At the end of the tutorial, you will be prepared to create and customize new themes. Along the way, you may develop questions about particular concepts that this tutorial does not answer in detail. But no need to worry: after working through the tutorial you can find much more in-depth information in the other theme topics, each of which take a focused look at a particular theme concept. Command Line Interface—Provides a console or terminal environment in which to execute commands.If you are developing on a Windows machine, Kibo eCommerce recommends you use the Windows command prompt. However, due to known Windows compatibility issues in Node.js, you may encounter issues when using the Arc.js tools (for example, the tools may not register your keystrokes). If you encounter such issues, Kibo eCommerce recommends you use a third-party console emulator, such as cmder, which plays nicer with Node.js. Node.js—Provides a platform for creating scalable network applications. Includes the npm package manager, which you use in this tutorial to install additional tools. Grunt.js—Provides a task manager that automates repetitive tasks. In this tutorial, you use Grunt to build your project files and upload them to Dev Center. Git—Provides a version control system for managing your project files. The tools you use to create a theme in this tutorial automatically configure a Git repository for your project. Kibo eCommerce frequently releases new themes and updates to the Core theme through Git, making it an essential part of your theme upgrade path. In addition to the listed software, you need access to a Dev Center Account that contains a provisioned sandbox. Dev Center is where your themes live. To upload theme files you&apos;ve created or modified, you must first create a theme record in Dev Center. In the Dev Center Console, click Develop > Themes. Click Save. You should now see your theme in the Themes grid. Double-click your new theme to edit it. Note the Application Key. You will need this value to configure the Kibo eCommerce Theme Generator and Dev Center Sync tools later in this tutorial. Creates new themes that inherit from the latest Kibo eCommerce Core theme or clones an existing theme from a Git repository to a local directory. You can also use the generator to upgrade existing themes. Refer to Upgrade Your Theme for more information. Configures your local theme directory as a Git repository. Connects the Kibo eCommerce Core theme Git repository (or any other theme Git repository) to your theme as a remote so you can merge upstream changes. This tool is a Yeoman plugin that generates the scaffolding (e.g., directory structure, reference files, and build files) necessary to package a Kibo eCommerce theme and upload it to Dev Center. It’s designed to augment, not overwrite, existing themes. If you have a theme that extends the Kibo eCommerce Core theme, you can safely run this tool in that directory without overwriting your existing files. Whenever Kibo eCommerce releases a Core theme upgrade, you can use this tool to merge changes from the Core theme ( or any other theme Git repository) with your theme. Open a Terminal (OS X) or a Command Prompt (Windows). Enter a public name for your theme. (Optional) Enter a short description of your theme. Select Kibo eCommerce Core Theme as the base theme from which your new theme will inherit. Select which version of the Kibo eCommerce Core theme from which your new theme will inherit. Enter your theme’s Dev Center Application Key. Enter your Developer Account login email. Enter your Developer Account password. You now have a blank theme based on the latest Kibo eCommerce Core theme, which you can modify, build, and upload to Dev Center. Since the Kibo eCommerce Core theme Git repository is connected to this Git repository as a remote, you’ll be able to merge upstream updates from the Core theme with your theme in the future. Now that you have your own copy of the latest Kibo eCommerce Core theme, you can begin making modifications. Open theme.json in your project&apos;s root directory for editing. This file contains the majority of your theme settings, structured in JSON format. In the about object, change the value associated with the name property from whatever you chose as a name to "Quickstart". Your local copy of your theme now contains changes that you can upload to Dev Center. Open a command prompt in your project&apos;s root directory. Run grunt to build your project assets and upload them to Dev Center. What does grunt do and what are the common options you can use with it? Note: If you’ve added new files at the root level of your theme directory, you must add each file name to the mozusync.upload.src section of Gruntfile.js to upload them using the grunt command. If you save a change to a theme file, grunt automatically builds and uploads your theme to Dev Center. This section is FYI-only. As an alternative to the build tools, you can manually upload a built and zipped package of your theme using the following steps. However, Kibo eCommerce recommends using the build tools in most cases. In the Themes grid, double-click MyFirstTheme. Drag your zipped theme file into the Upload files dialog box. When the upload is complete, click Done. Click Packages. You should see the contents of your theme ZIP file. After your theme builds, install your theme to a sandbox so you can later apply the theme to a site. You only need to do this once. After installation, your theme remains installed on the sandbox until you remove it. In the theme toolbar at the top right, click Install. In the Select a Tenant dialog box, select the sandbox you previously created. Now your theme is installed in your sandbox. The next step is to apply it to a site within your sandbox. In the Dev Center Console, click Sandboxes. In the Sandboxes grid, right-click the sandbox you installed your theme to and select View. Click Main > Site Builder > Themes. Click the dots on the Quickstart theme and click Apply. Click Main > Site Builder > Editor. From the View drop-down menu, click View Staged Site. It doesn&apos;t look very impressive right now, but don&apos;t worry! All you have done is taken the latest Core theme, renamed it, uploaded it, and applied it to a site. The rest of this tutorial guides you through more comprehensive theme changes. Tip: You do not need to reinstall or reapply your theme from this point forward. Any updates you upload to the theme record in Dev Center using grunt are immediately available on sites that theme is installed to. In fact, if you run the grunt watch command in your local theme directory, any changes you make locally will be continuously synced with Dev Center. Just refresh your web browser to see the changes on your storefront. In this section, you take advantage of a default theme setting to add a banner image to your website. If you haven&apos;t already done so, run grunt watch in your project&apos;s root directory. From here on out, all local changes to your theme files will be automatically pushed to your site. Open theme.json in your root directory. In the settings object, change the value of bannerImageEnabled to true. Note that the value of bannerImage is set to "../resources/images/banner.jpg". Navigate to the resources/images directory in your theme files and add an image of your choice, named banner.jpg, to serve as your banner image. Refresh your browser or use Site Builder to view your staged site again. Your banner image appears as the header background at the top of every page on your site. How exactly does this theme setting work? Open page.hypr in the templates directory. This is the base Hypr template that all other pages on your site extend. All content enclosed in block tags is sent to child templates that extend the current template (so these lines of code get picked up by every other page on your site that extends page.hypr). Within the block, another templates is included using the include tag, and its contents are rendered. Open the page-header.hypr template in the templates/modules directory. Open page-header.less in the stylesheets/modules directory. This stylesheet contains the style rules for the relevant header class. You can see how the path to the banner image you added is extracted from the themeSettings variable. There are many other useful settings in theme.json that you can use for theme development. You can also add your own settings to this file as well, and access those custom settings throughout your theme templates using the themeSettings variable if the header has the appropriate class applied. Tip: To view every property within a Hypr global variable, such as the model or themeSettings objects, use the dump tag within a Hypr template. If you go to Main > Site Builder > Themes, you can click the dots by any theme and click Settings to view available settings that can be configured by Admin users. In this section of the tutorial, you modify the settings that display on this page. Open theme-ui.json in your project&apos;s root directory. This file controls the theme settings that display in Site Builder. This code adds a panel to your theme settings that includes a text area, checkbox, and a multi-select drop-down that requires at least one value to be selected. You can access the values of these inputs using the themeSettings variable and the name of the input in question (for example, themeSettings.enableOverdrive). However, you also have to add the setting to theme.json to make it accessible through the global variable. If the name of a setting in theme-ui.json is the same as the name of a setting in theme.json, and a user has provided a value in Site Builder, then the theme-ui.json setting takes precedence. 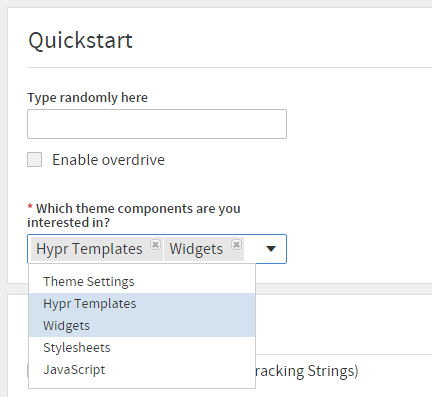 After saving your changes, the newly-added "Quickstart" panel displays in Site Builder. If you open category.hypr in the templates/pages directory, you see that it includes category-interior.hypr. This template uses the include_products tag to load a product model from the faceted-products.hypr template in the templates/modules/product directory. This templates renders a list of products for the category using the product-list-tiled.hypr.live template, which extends the product-list.hypr.live template. In this section of the tutorial, you edit product-list.hypr.live to add a dropzone for a custom widget that you create later in the tutorial and then edit product-listing.hypr.live to make small changes to how products display on a category page. Open product-list.hypr.live in the templates/modules/product directory. Note that this template includes product-listing.hypr.live (with the local variable model set to the current product model in the loop) to render product details for each product tile in the category list. Open product-listing.hypr.live in the templates/modules/product directory. After you save your changes, the first listing on a category page is an empty dropzone and product names display above the product image. In this part of the tutorial, you make styling changes to the unordered list that displays products on a category page. Open product-list.less in the stylesheets/modules/product directory. After you save your changes, product listings rotate whenever a shopper hovers over them. Within Site Builder, widgets allow merchants to drag-and-drop specialized functionality to predetermined areas of storefront pages. 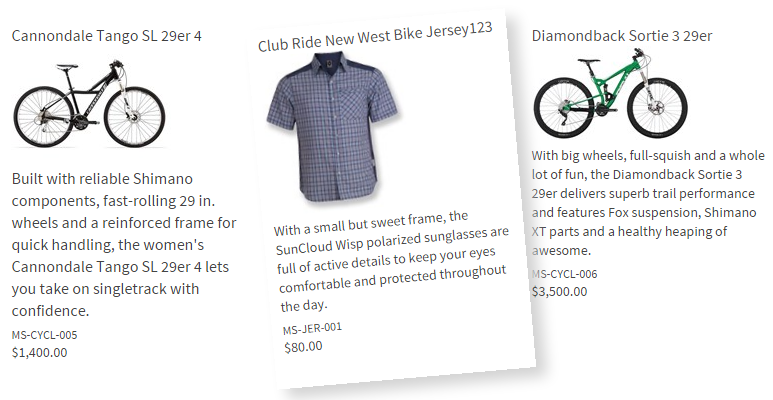 Kibo eCommerce provides several built-in widgets, but you can create your own widgets as well. Open theme.json in your theme&apos;s root directory. Locate the widgets array. This array contains a collection of widget configurations. Add your chosen widget icon to the resources/admin/widgets directory. The preceding code uses the 30_employee_picks.png image, which you can download below, but you can use any icon of the same dimensions. Note: The numbering system used by the default Kibo eCommerce widget icons is for organizational purposes within the local folder, but does not affect how the widget icon displays in Kibo eCommerce. The widget configuration data adds an "Employee Picks" widget that you can add to any page on your site. When you drag the widget onto a dropzone, a menu displays that allows you to select an employee picture and background image for the widget. The menu also contains fields that render details about the employee alongside the employee&apos;s product recommendation. Go to Main > Site Builder > Editor. Click on a Category page in the Navigation section of your site tree. Click Widgets to display a list of widgets. Drag the "Employee Picks" widget onto the product list dropzone (although any dropzone will work) that you created in Section 3.0 of this tutorial. When you drag the widget onto the dropzone, you should see the configuration menu. However, the widget isn&apos;t functional until you create a template for it to render content, as described in the next section of this tutorial. Create a file called employee-picks.hypr in the templates/widgets/misc directory. The template renders the images and text that Site Builder users enter in the widget menu. The template leverages the make_url tag to create links to uploaded images and uses the model.config object to access data from the widget configuration menu. In the previous section, you created a template to render content for the widget. In this section, you create a stylesheet to style that content. Create a file called employee-picks.less in the stylesheets/widgets directory. Open storefront.less in the stylesheets directory. Your widget is complete! Return to the Site Builder editor to test it out. When you drag and drop the Employee Picks widget onto a dropzone, you can upload pictures of your choice to render a background for the widget and a profile pic for an employee. You can then add brief facts about the employee and describe which products the employee enjoys. 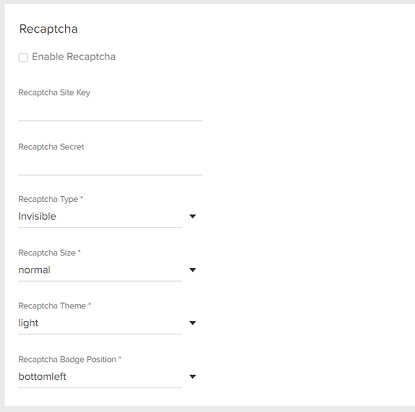 One example of functionality that can be implemented via themes is reCAPTCHA. This feature can be added to the store login page and popover modal for additional security and to protect the server from being bogged down by repetitive failed login attempts. When enabled, login attempts are only be validated if the reCAPTCHA secret exists in theme settings. Merge with the latest eCommerce theme changes. Go to Theme Settings and set the configurations under the Recaptcha system. Recaptcha Type: Choose Invisible to use an invisible captcha that validates real users through mouse movements and other secret Google algorithms. Choose &apos;I&apos;m not a robot&apos; to use a checkbox widget to validate real users. Note that even if you choose Invisible or I&apos;m not a robot, very suspicious users will still be required to solve an image captcha. Recaptcha Badge Position: Controls the position of the Google Recaptcha badge that appears on pages protected by Recaptcha. How to create a theme application in Dev Center. How to scaffold theme assets using the Kibo eCommerce Theme Generator, which creates the necessary theme files within a Git repository. How to use grunt to lint your source code and upload it to Dev Center (and grunt watch to do this anytime you save a change to your local theme files). How to install a theme to a sandbox for the first time. How to apply a theme to one of your sites using Site Builder. How to view your theme in the Site Builder editor. How to add or make changes to the settings in theme-ui.json, which display in Site Builder under Theme Settings. How the Hypr rendering language extends and includes other templates. 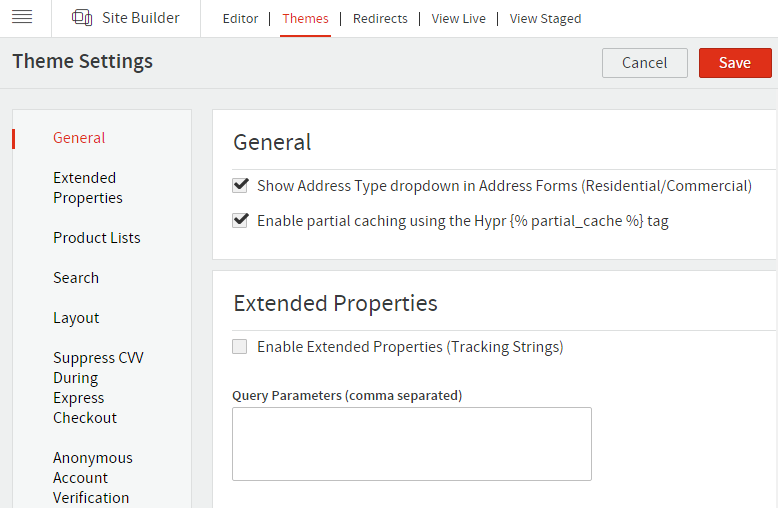 How Hypr templates use HTML, Hypr tags and filters, and global variables to render content. How to use LESS stylesheets to style the content that Hypr templates render. How to create a custom widget that enable merchants to make on-the-fly changes to storefront pages. To learn more about themes, refer to the other theme topics in the menu. Be sure to check out the reference help for detailed information about the tags, filters, variables, and form controls available in themes.